In this context, the effective and cost-efficient settlement of insurance disputes is an important driver for the industry's success. It ensures legal certainty and fosters the trust that is placed into the sector. The following essay will give an overview of the legal framework for insurance disputes in Germany and highlight the current jurisprudence of German courts. the introduction of a new place of jurisdiction at the place of the policyholder's residence (Section 215(1) VVG). The overarching purpose of the reform was to provide greater protection to the insured person by setting out restrictions to the freedom of contract. The restrictions shall, however, not apply to large risks and open policies.8 Large risks are risks of: (1) certain transportation and liability insurances (such as insurances for railway vehicles, aircrafts or the transportation of large goods); (2) certain credit and suretyship insurances; and (3) certain property, liability and other indemnity insurances where the policyholder exceeds a balance sheet total of €6.2 million, a net turnover of €12.8 million or an average of 250 employees per fiscal year.9 These insurances are typically taken out by big companies that are not in need of protection by the VVG. All other risks are deemed 'mass risks', to which the restrictions to the freedom of contract apply without limitation. Another source of German insurance law is the German Civil Code (BGB), which is applicable insofar as no specific provisions of the VVG apply. The area of most relevance for insurance contracts is its section on the use of standard business terms. Almost all insurance contracts contain standard business terms of the insurer, especially insurance contracts concluded with a consumer. Sections 305 et seq. BGB set out the rules for the incorporation of standard business terms into the contract, the assessment of their effectiveness and the interpretation of their content. These rules apply regardless of whether the other party is a consumer or not. However, stricter requirements apply in case a consumer is concerned. Other provisions applicable to insurance law are the rules on the statute of limitations. As the special limitation periods for insurance claims were abrogated with the VVG reform in 2008, the general rules in Sections 195 et seq. BGB apply. The limitation period is three years,10 commencing at the end of the year in which the claim arose and the insured party obtained knowledge of the circumstances giving rise to the claim (or would have obtained such knowledge if it had not shown gross negligence).11 An exception applies if the limitation period is suspended. For insurance contracts, Section 15 VVG provides an insurance-specific suspension rule. Where a claim arising from an insurance contract has been registered with the insurer, the limitation period shall be suspended until such time as the applicant has received the insurer's decision in writing. All other rules for suspension are set out in Sections 203 et seq. BGB. A further source of German law that is especially relevant for insurance disputes is the German Code of Civil Procedure (ZPO). It sets out the general rules for litigation proceedings and is also applicable to insurance disputes as far as no specific rules are set out in the VVG. One of the main principles of German civil procedural law is that each party has to present the facts and prove the case upon which its claim or defence is based. Unlike in common law jurisdictions, there is no pretrial discovery or document production. In general, no party to litigation proceedings is therefore obligated to deliver to the other party the documents or evidence necessary for its case. However, there are exceptions to this principle. One example is Section 142 ZPO, which sets out that the court may direct one of the parties or a third party to produce records or documents, as well as any other material in its possession if one of the parties made reference to it. Another example is Section 422 ZPO, which stipulates the obligation of a party to produce certain documents favourable for its opponent if it is entitled to demand the surrender or production of the respective documents pursuant to civil law stipulations. Another specific aspect of insurance disputes concerns direct claims of third parties against the insurer. This issue typically arises in relation to liability insurances that cover damage claims made by third parties against the policyholder. In general, a third party cannot make direct claims under the insurance contract against the insurer of the damaging party. Therefore, the third party may only enforce its damage claim against the policyholder ('liability claim') who may then raise a claim against his or her insurer ('coverage claim'). However, there are exceptions to this rule. One is set out in Section 115 VVG, which provides a direct claim of the third party against the insurer if: (1) third-party vehicle insurance is concerned; (2) the policyholder has become insolvent; or (3) the policyholder's whereabouts are unknown. If one of these requirements is fulfilled, the third party may directly claim payment from the insurer and initiate court proceedings against it without having to proceed against the policyholder first. The ZPO also stipulates the place of jurisdiction for litigation proceedings regarding claims in connection with the insurance contract. Optional places of jurisdiction are the place of the insurer's registered seat,13 the place of performance of the contract14 or the place of the insurer's branch office.15 In general, all these venues favour the insurer. With the introduction of Section 215 VVG in 2008, the legislator established a new place of jurisdiction that favours the insured person. The policyholder can now also choose to proceed against the insurer at the court in whose district he or she has his or her place of residence. For actions brought against the policyholder, only this court shall have jurisdiction. The parties can only deviate from this place of jurisdiction to the detriment of the policyholder after the dispute has arisen or if the policyholder moves his or her domicile to a different country after signing the contract or if his or her domicile is unknown at the time the action is filed.16 The purpose of this change was to guarantee the policyholder access to a court near his or her domicile.17 This was supposed to compensate for the subject-specific and economic advantages of the insurer. Therefore, all private and public insurance companies, pension funds and reinsurers carrying out private insurance businesses within the scope of the VAG and that have their registered office in Germany are subject to supervision.19 Social insurance institutions20 are not supervised under the VAG but regulated by other government agencies. In its ongoing supervision, the BaFin monitors, among other things, whether the insurance company complies with all statutory and regulatory requirements, whether it is capable of fulfilling its insurance contracts and whether it observes the principle of good business practice (e.g., keeping proper accounting records and rendering proper accounts).28 In accordance with the Solvency II Directive, it also supervises the company's solvency, in particular the fulfilment of certain capital requirements. In case of any undesirable conduct by an insurance company, especially non-compliance with legal requirements, the BaFin may take any appropriate and necessary measures to prevent or eliminate this conduct (Section 298 VVG). For consumers, it is also possible to file a complaint against an insurance company with the BaFin.29 The BaFin will review the complaint and issue a report with its legal opinion. If necessary, it may also take regulatory steps against the insurance company. However, it is not authorised to render a binding decision or give legal advice. German insurance law differs between two types of insurable risks: socially insured risks and privately insured risks. Socially insured risks are codified in the German Social Code (SGB), which distinguishes between health insurance, unemployment insurance, nursing care insurance, pension insurance and occupational accident insurance. They are statutory insurances that do not come into effect by agreement but are taken out by law when the insured person fulfils certain requirements. The VVG only applies to privately insured risks. Because of the freedom of contract, the parties to an insurance contract may, in principle, insure any type of risk they chose to. They are only bound by the limitations applicable to any civil law contract (e.g., the prohibition of contracts that violate public policy or a statutory prohibition).30 The VVG regulates the most common types of private insurance in Germany by stipulating the rules applicable to the different insurance branches. The most relevant branch in Germany is the liability insurance that insures damage claims of a third party against the policyholder.31 What is special about this insurance branch is that some liability insurances are on a voluntary basis while others are compulsory insurances. This is the case where the legislator deemed it especially important to insure the risk of damages to a third party caused by the conduct of another party. The most prominent example of compulsory liability insurance is the third-party vehicle insurance, from which the other compulsory insurances evolved.32 Other insurance branches stipulated in the VVG are legal expenses insurance, transport insurance, fire insurance for buildings, life insurance, occupational disability insurance, accident insurance and private health insurance. In general, arbitration and other alternative dispute resolution mechanisms (ADR) have experienced an expansion in recent years.33 In Germany, however, the popularity of arbitration and ADR rather depends on the type of insurance contract concerned. A distinction can be drawn between reinsurances, insurances for commercial and industrial risks and insurances for 'mass risks'. Disputes regarding reinsurances are traditionally solved amicably between the parties.34 The reason for this is a kind of 'gentlemen's agreement' to solve reinsurance disputes by negotiations for amicable settlement. However, arbitration proceedings have become more and more common in the past 30 years and most reinsurance contracts now also contain arbitration clauses. This may be attributed to an increased willingness in the Anglo-American reinsurance market to refer reinsurance disputes to arbitration, which also reflects on the German market. Another reason might be the increase of disputes regarding large risks that involve higher stakes for the parties. A third factor may be that more reinsurance companies withdraw from the reinsurance market, making it less necessary to solve disputes amicably to retain ongoing business relationships. In German insurance contracts concerning 'mass risks', arbitration clauses are basically non-existent.37 This is owing to the fact that they are often concluded with 'consumers' under German consumer protection law, which significantly raises the bar for a valid arbitration agreement. Section 1031(5) ZPO states that arbitration clauses involving consumers are only valid if they are contained in a separate record or document signed by both parties that shall not contain agreements other than those making reference to the arbitration proceedings. If the arbitration agreement is included in a contract, it is only valid if it has been recorded by a notary. Both requirements are rather difficult to fulfil in practice. In addition, arbitration clauses in insurance contracts are usually part of the insurer's general terms and conditions and therefore have to fulfil the requirements set out in Sections 305 et seq. BGB (see above under Section II (i) BGB). This leads to a high risk that an arbitration clause contained in an insurance contract for mass risks could be deemed invalid by a court. In the past 18 months, the Federal Court of Justice (BGH) handed down a number of landmark decisions for insurance disputes. In a recent judgment of 8 November 2017, the BGH affirmed the applicability of Section 215(1) VVG to legal entities under private law,48 which had been a highly controversial issue since the introduction of Section 215 VVG in 2008. In the case at hand, the question was whether the insured company could sue its insurer at the place of its registered seat according to Section 215(1) VVG in conjunction with Section 17 ZPO, or whether the general terms and conditions of the insurance contract applied, according to which the insurer would have to be sued at the place of the insurer's office. The BGH found that, although the wording of Section 215(1) VVG was ambiguous regarding its application to legal entities, it had not been the objective of the legislator to make a distinction between natural persons and legal entities.49 The intention of the VVG was to protect the insured person regardless of its legal form or status as a consumer. Another objective of the legislator had been to provide a place of jurisdiction that is closest to the facts of the dispute to make the ordering of evidence easier and faster.50 According to the BGH, this purpose applied to natural persons and legal entities alike. Therefore, it came to the conclusion that in the case at hand, Section 215(1) VVG could not have been derogated by the general terms and conditions of the insurer. The insurer could be sued at the place of the insured company's registered seat. A further disputed issue recently decided by the BGH concerned the suspension of the statutory limitation period under Section 115(2) VVG.56 It stipulates for direct claims of a third party against the insurer – in conformity with Section 15 VVG – that the limitation period is suspended until the claimant receives the insurer's decision in writing. In the case at hand, a third party had suffered damages from a car accident with the insured person. The social insurance company of the third party had made claims to the insurer of the insured person in 2007. The insurer had covered the costs in 2009. In 2013, the social insurance company of the third party demanded further payment. The insurer denied this on the basis that the claim had become time-barred, arguing that the suspension of the limitation period had ended with the acceptance of the first claim in 2009. It was therefore for the BGH to decide what requirements the insurer's decision had to fulfil to end the suspension under Section 115(2) VVG. The BGH came to the conclusion that the insurer's acceptance of payment in 2009 had not ended the suspension of the limitation period.57 According to its reasoning, it was not sufficient for the fulfilment of the requirements of Section 115(2) VVG that the insurer's decision had been positive. The BGH stated that in case of a claim for all damages in relation to the insured event, the suspension would only end if the insurer's decision made a clear and full statement regarding all potential (future) claims.58 This followed from the purpose of Section 115(2) VVG, which required that a decision from the insurer guaranteed the injured party that all future claims arising out of the insured event will be paid for voluntarily. Such a guarantee could not be seen in the first payment of the insurer as it had made no further statement regarding future claims. Hence, the limitation period had still been suspended under Section 115(2) VVG at the time the social insurance company had raised the second claim. It could therefore still claim payment under the insurance contract. In the case at hand, the insurer had refused to cover the company's damage claim resulting from a breach of contract by its directors and officers. The liable directors and officers had remained inactive. Therefore, the company had filed a declaratory action against the insurer to receive a judgment on the insurer's obligation to cover the damage claim. However, it was questionable whether the company was entitled to raise such a direct claim as the general terms and conditions of the insurance contract set out that only the insured persons could make a claim for coverage under the insurance contract. The BGH affirmed this with its decision of 5 April 2017 and held that under certain conditions, it would be contrary to the principle of good faith and the objectives of the indemnity insurance to invoke such a clause.60 This was the case here as the insurer had already denied to cover the company's damage claim and the insured persons had refused to pursue the claim against the insurer.61 It had led to a risk for the claim to become time-barred.62 The BGH therefore came to the conclusion that it would cause the company considerable harm if it were denied the opportunity to make a direct claim against the insurer. Under the circumstances at hand, the company could not be required to file a claim against its directors and officers to force them to raise a claim for coverage against the insurer.63 Furthermore, it did not constitute any disadvantage for the insurer or the insured persons that the company pursued the claim for coverage directly. After all, the insured persons had already refused to make use of their right and the insurer was therefore not in danger of being sued twice.64 Hence, it was justified in allowing the company a direct claim under the insurance contract. Cross-border insurance contracts have proliferated in recent years, putting insurance disputes increasingly into a more international context. Frequent questions that arise in cross-border insurance disputes regard the correct place of jurisdiction and the applicable law. For German courts, EU Regulation (EC) No. 593/2008 of 17 June 2008 on the law applicable to contractual obligations (Rome I) and EU Regulation (EC) No. 1215/2012 of 12 December 2012 on jurisdiction and the recognition and enforcement of judgments in civil and commercial matters (recast) (Recast Brussels Regulation)70 set out the relevant rules for these questions. Regarding the question of jurisdiction, the Recast Brussels Regulation provides the relevant rules for legal proceedings instituted on or after 10 January 2010 against a defendant that has its domicile72 in a Member State and concern a dispute that is not located solely in one Member State (e.g., one of the parties has its residence or place of business in one Member State, the other party in another Member State or a third state). 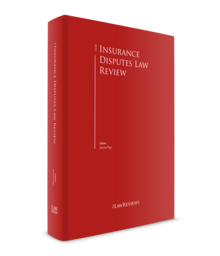 It contains specific rules for insurance disputes in Articles 10–16. The rules are similar to those under German law (see Section II.i, 'German Code of Civil Procedure (ZPO)'). If the defendant has its residence in Switzerland, Norway or Iceland, the Lugano Convention (2007) applies with corresponding rules. The Recast Brussels Regulation also applies to the enforcement of judgments rendered by a court of a different Member State. In general, such judgments shall be recognised and enforceable in the other Member State without any special procedure or declaration of enforceability being required.73 However, the Recast Brussels Regulation does not apply to the enforcement of arbitral awards.74 Regarding the recognition and enforcement of foreign awards by a German court, the rules of the Convention of 10 June 1958 on the Recognition and Enforcement of Foreign Arbitral Awards (New York Convention) apply.75 Regarding the recognition and enforcement of domestic awards, the rules of the ZPO apply. In view of the current jurisprudence of the BGH and German higher regional courts, there seems to be an increasing number of landmark decisions on insurance-related disputes. Accordingly, it seems that parties to insurance disputes have become less reluctant to receive a final and binding decision in state court proceedings. Whether this is a trend that will continue in the future, however, cannot yet be predicted. 1 Marc Zimmerling is a partner and Angélique Pfeiffelmann is a senior associate at Allen & Overy LLP. 4 It is therefore important to consider carefully whether decisions and publications on insurance law refer to the current or the old rules of the VVG. 5 Entwurf eines Gesetzes zur Reform des Versicherungsvertragsrechts of ۲۰ December ۲۰۰۶, Bundestagsdrucksache ۱۶/۳۹۴۵, p. ۱. 6 Which allowed the insurer to refuse payment for the insured event if it was caused by the insured person, regardless of the degree of misconduct. 7 Which stipulates that the insurer may only refuse payment in full if the insured person caused the insured event intentionally; in case of gross negligence, the insurer may refuse payment only partly depending on the degree of negligence. 8 Section 210(1) VVG; an open policy is a contract made in such a manner that, at the time when the contract is concluded, only the class of insured interest is designated and it is only specified to the insurer in detail once the contract has been concluded, Section 53 VVG. 9 Section 210 (2) VVG enumerates all large risks conclusively. 12 Rixecker in Römer/Langheid, VVG, 4th edition 2014, Section 31 . 16 Section 38(3) ZPO, Section 215(3) VVG. 17 Klimke in Prölls/Martin, VVG, 30th edition 2018, Section 215 . 20 i.e., statutory health insurance funds, statutory pension insurance fund, statutory accident insurance institutions and unemployment insurance institutions. 21 This includes SEs, mutual societies or public-law institutions, Section 8(2) VAG. 23 Section 8(4) VAG; see also www.bafin.de/dok/7859578. 25 Section 9(2) No. 4 VAG. 26 Section 9(2) No. 5 VAG. 27 Section 9(4) No .1 Lit a) VAG. 30 Langheid/Wandt, Recast Brussels Regulation Kommentar zum VVG, 2nd edition 2016, Section 1 . 31 Lücke in Prölls/Martin, VVG, 30th edition 2018, before Section 100 . 32 Klimke in Prölls/Martin, VVG, 30th edition 2018, introduction to Sections 113–124 . 33 Wolf, NJW 2015, 1656 (1659). 34 Gal in Langheid/Wandt, Münchener Kommentar zum VVG, 2nd edition 2017, chapter 130 –. 35 Gal in Langheid/Wandt, Münchener Kommentar zum VVG, 2nd edition 2017, chapter 130 –. 36 Gal in Langheid/Wandt, Münchener Kommentar zum VVG, 2nd edition 2017, chapter 130 . 37 Gal in Langheid/Wandt, Münchener Kommentar zum VVG, 2nd edition 2017, chapter 130 –. 39 Section 2(1) Code of Procedure of the Insurance Ombudsman (VomVO). 46 Sections 10(3), 11(1) VomVO. 47 Annual report of the Insurance Ombudsman Association, p. 2, www.versicherungsombudsmann.de/wp-content/uploads/Jahresbericht2017.pdf. 48 BGH, Judgment of 8 November 2017, IV ZR 551/15. 49 BGH, Judgment of 8 November 2017 . 50 BGH, Judgment of 8 November 2017 . 51 Armbrüster, EWiR 2018, 63 . 52 Mankowski, VersR 2018, 182 . 53 Armbrüster, EWiR 2018, 63 ; Mankowski, VersR 2018, 182 . 54 BGH, Judgment of 14 March 2017, IV ZR 435/15. 55 BGH, Judgment of 14 March 2017, IV ZR 435/15 . 56 BGH, Judgment of 14 March 2017, VI ZR 226/16. 57 BGH, Judgment of 14 March 2017, VI ZR 226/16 . 58 BGH, Judgment of 14 March 2017, VI ZR 226/16 . 59 BGH, Judgment of 5 April 2017, IV ZR 360/15. 60 BGH, Judgment of 5 April 2017, IV ZR 360/15 . 61 BGH, Judgment of 5 April 2017, IV ZR 360/15 . 62 BGH, Judgment of 5 April 2017, IV ZR 360/15 . 63 BGH, Judgment of ۵ April ۲۰۱۷, IV ZR ۳۶۰/۱۵ . 64 BGH, Judgment of 5 April 2017, IV ZR 360/15 . 65 BGH, Judgment of 15 November 2000, IV ZR 223/99. 66 BGH, Judgment of 13 April 2016, IV ZR 304/13. 67 Thiel and Seitz, NJW 2017, 2466 –. 68 BGH, Judgment of 5 April 2017, IV ZR 360/15 . 69 BGH, Judgment of 15 November 2000, IV ZR 223/99. 70 As well as its predecessor Council Regulation (EC) No. 44/2001 of 22 December 2000 on jurisdiction and the recognition and enforcement of judgments in civil and commercial matters, which still applies to legal proceedings instituted before 10 January 2015 as well as to judgments given or court settlements concluded before that date (Article 66 of the Recast Brussels Regulation). 71 Rome I does, however, not apply to insurance contracts providing benefits for employed or self-employed persons in the event of death or survival or of discontinuance or curtailment of activity, or of sickness related to work or accidents at work, excluding life assurance according to Article 9 No 2 of the Solvency II Directive. 72 For a company, this would be the place where it has its statutory seat, central administration or principal place of business, Article 63 of the Recast Brussels Regulation. 73 Articles 36(1), 39 of the Recast Brussels Regulation. 74 Article 1(2)(d) of the Recast Brussels Regulation.